Ask an Arlington resident what motivates someone to pack their bags for a visit to our fair city, and you’ll get a pretty standard set of answers: business at the Arlington Convention Center, the lure of Six Flags roller coasters, a concert at AT&T Stadium, a Texas Rangers or Dallas Cowboys game— and during the season, a possible visit to Hurricane Harbor. The well’s origins date back to 1891, when local businessman Rice Wood Collins (yep, the namesake of Collins Street) launched a campaign to finance the drilling of a public water source for Arlington, then a cotton-ginning and farming community and stop on the Texas-Pacific Railroad. Evidently it was a successful effort, because the City of Arlington authorized the project a couple of years later in 1893, when drilling commenced at the corner of Main and Center streets under the supervision of a gentleman named Sam Shafer. Records note the fact that he used a wood-powered steam engine, which we’re guessing was pretty cutting-edge in the 19th century. Once constructed, the well quickly assumed an important role in the small town’s daily life. Not just because it was a water source for local homes, businesses, and the occasional horse, but because the well performed double duty as a symbolic designation of the heart of a growing community. Community doings and small-town nostalgia weren’t the only activities associated with Arlington’s mineral well. “Taking in the waters”—that is, drinking or bathing in mineral-laced waters that were thought to have medicinal qualities—was in that era a very popular health and wellness pastime, somewhat akin to our contemporary fixation with yoga classes or gluten-free diets. 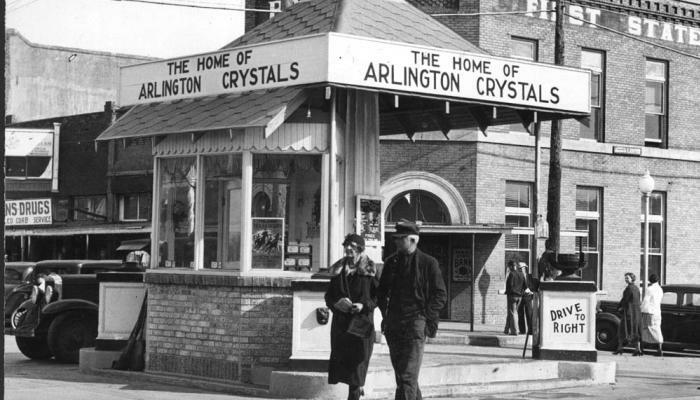 America’s obsession with healing waters began to wane after the 1920s, and although the Arlington well had its share of fans, Arlington as a mineral water destination never caught on to the extent that it did in places like Mineral Wells, TX. Still, the well continued to serve as a significant Arlington landmark through the beginning of Arlington’s post-war industrialization boom, until it was permanently capped under the pavement in 1951 to make way for the ever-increasing auto traffic in Downtown Arlington. The Arlington well was far from the only mineral water destination in Texas. Indeed, the Arlington well was one of about 100 mineral springs destinations located across the Lone Star State, drawing thousands of visitors each year during the height of the healing waters craze. One hot spot, the ultra-luxurious Baker Hotel in nearby Mineral Wells, offered high-dollar mineral spa treatments that attracted Hollywood elite and other A-list visitors for a couple of decades. Arlington’s well water wasn’t popular with everyone. military academies that were forerunners of today’s UT-Arlington. The well’s reputation improved, though, once it gained status as a source of healing water. Our well was kind of fancy. In 1910, the Commercial Club, a forerunner of today’s Chamber of Commerce, funded the construction of two ornate fountains at the site of the well, one of them featuring lions’ heads atop a four-sided pyramid. Later, part of the well’s platform was enclosed with brick and plate glass windows that displayed those miracle crystals. Article sources: Fielder Museum, the City of Arlington, the UT Arlington Library, the Star-Telegram archives.